One of my goals from last year that I’m carrying into 2019 is to eat more veggies, more often. I’ve always liked sweet potatoes, but last year I took a liking to Brussels sprouts. I figured out how to cook them in ways that I like, so they’ve become a regular veggie in my diet. They’re not all that bad, especially with a little crunch! Related: I need to figure out how to make fried Brussels sprouts that aren’t dripping in grease or oil. Several restaurants in Chattanooga have some delicious fried Brussels sprouts, and I want to figure out how to make them at home. When meal prepping, I love meals that I can cook all at once and get a lot of mileage out of for a few days. I love cooking, but I don’t want to do it every day of the week. As a plus, sheet pan dinners require only one cooking vessel: a sheet pan. The fewer dishes I have to clean, the better. I stumbled upon a variation of this sheet pan dinner on Pinterest a few weeks ago. 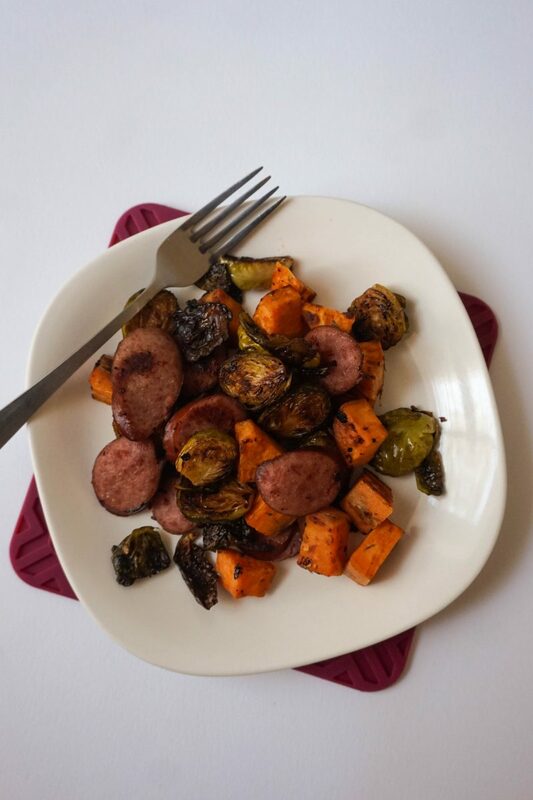 I wasn’t a fan of the veggie medley that recipe used, so I mixed up my own with sweet potatoes and Brussels sprouts. For the protein, I picked up a turkey kielbasa sausage at Aldi. It’s a bit milder and leaner, but still has plenty of flavor to complement the veggies. My only challenge here is that Brussels sprouts don’t exactly age well as leftovers. 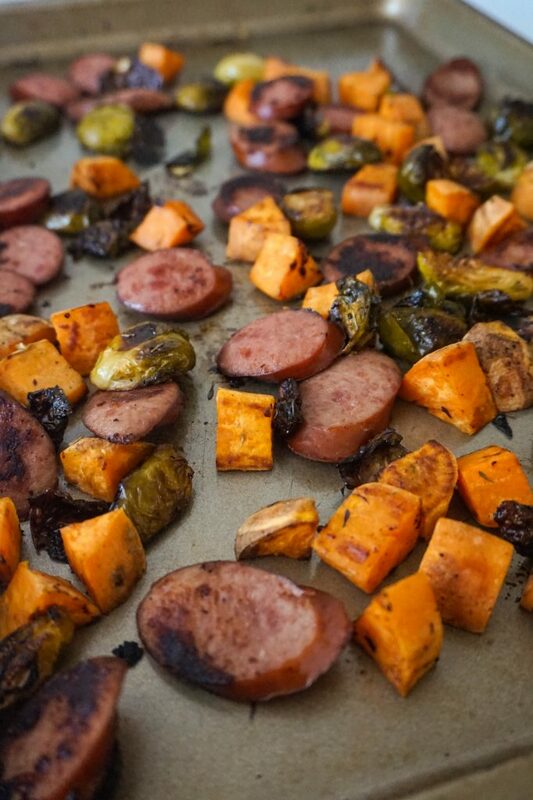 Here’s my recipe for an easy sheet pan dinner with savory sausage and veggies. 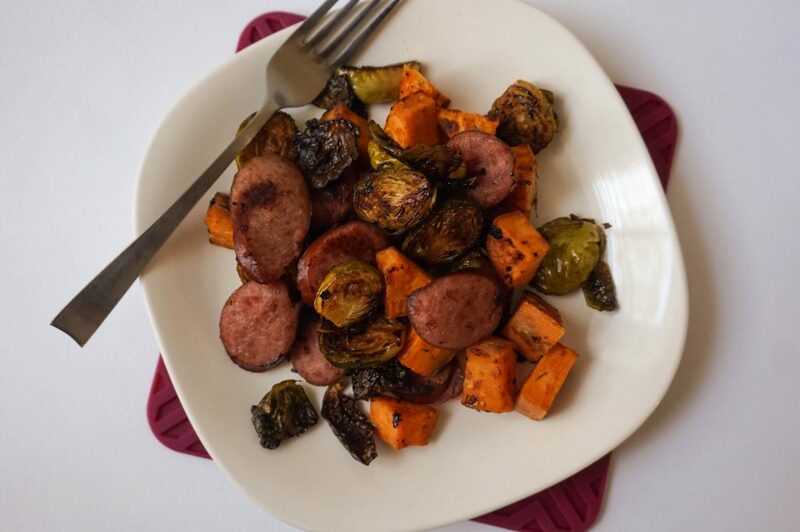 I use sweet potatoes and Brussels sprouts, but you can switch it up and use whichever veggies you’d like. I’ve also tried it with regular potatoes and zucchini. Definitely prefer sweet potatoes and Brussels sprouts. Preheat the oven to 375 degrees F. Lightly grease a baking sheet with non-stick spray. Drizzle 1 tbsp of EVOO over the sweet potatoes, then season with salt, pepper and thyme. Toss to coat, and then arrange them on the prepared baking sheet. Toss Brussels sprouts in the remaining EVOO, balsamic vinegar, salt and pepper. Arrange them on the baking sheet next to sweet potatoes. Bake veggies for 10-11 minutes. While the veggies are baking, slice the sausage into 1/2-inch pieces. Season if you wish, but it’s not necessary. Add sausage to the sheet pan with veggies, and bake for another 10-12 minutes. Toss/flip halfway through, if desired, for a more even roast. Serve over rice if desired, or enjoy by itself. This makes a great meal in itself, or it can be done as a side dish with a bigger meal. It also makes enough for 2-3 days of leftovers. 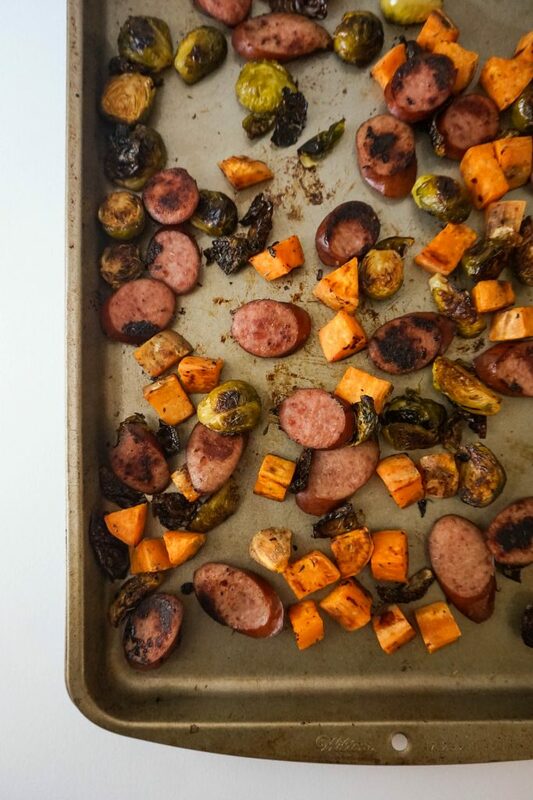 Have you ever made a sheet pan dinner? What’s your favorite?